Whilst birding the Asir mountains of the Tanoumah area in southwest Saudi Arabia, I came across a plant I could not identify. I was not able to identify the plant so asked Irene Linning who is a plant expert and who previously lived in Saudi Arabia if she could identify it for me. 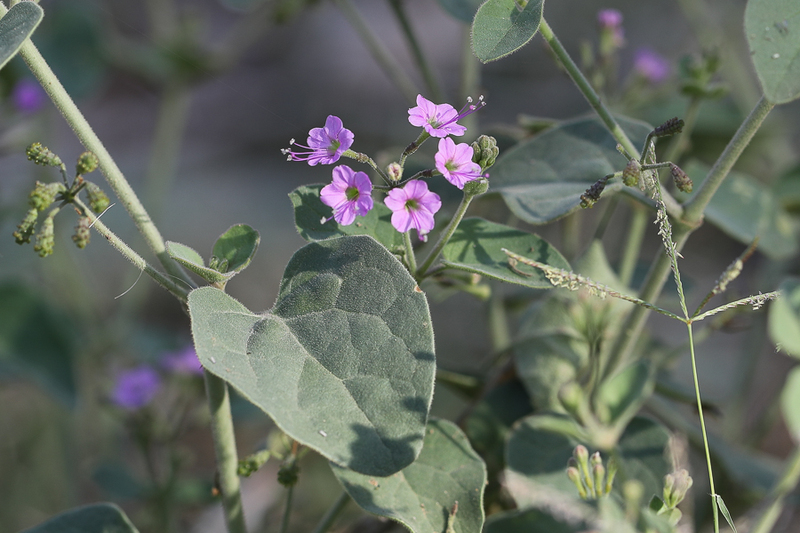 Irene said it was Commicarpus grandifloras that grows at high altitude and to about 60 centimetres tall with flowers about 6 mm wide and sticky leaves. They occur in Africa as well as Saudi Arabia (NW-Saudi Arabia: Hejaz, SW-Saudi Arabia: Asir) the Sinai peninsula (Southern Sinai) and Yemen (N-Inner Yemen, W-Yemen). Commicarpus are usually perennial herbs or subshrubs. Stems slender, prostrate, scrambling or ascending, branching; often woody toward the base; glabrous or pubescent. Sometimes large and small shrubs with woody stems. Leaves opposite, petiolate, simple. Distinctive glandular-pubescence and stickiness of C. grandiflorus separates it from most other Commicarpus species.